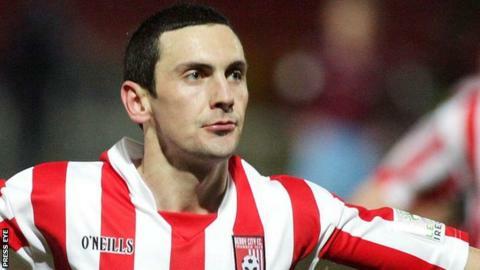 Former Derry City and Glenavon striker Mark Farren has died, aged 33. Farren, Derry's record goalscorer, had been receiving treatment for an aggressive brain tumour and his death was announced on Wednesday. The Donegal man played for City from 2003 to 2012, scoring 113 goals in 209 appearances for the club. Among those to pay tribute to Farren was West Bromwich Albion and Republic of Ireland winger James McClean, who played alongside him for Derry. City chairman Phillip O'Doherty said: "We offer our sympathies to his family. Last year, an appeal was launched to pay for Farren to travel to a cancer centre in Mexico for emergency treatment. He became Derry City's all-time top goalscorer in 2012, when he overtook Liam Coyle's tally of 112. Farren was in the Derry teams that won the FAI Cup in 2006 and 2012, and was voted player of the year by the Professional Footballers' Association of Ireland in 2005. He left Derry to join Irish League club Glenavon in 2013 but was forced to quit the game because of his illness.